KIEV, Ukraine -- I did not ask her name. We were off duty, out for a rare meal. We made small talk with her near the end of the evening. 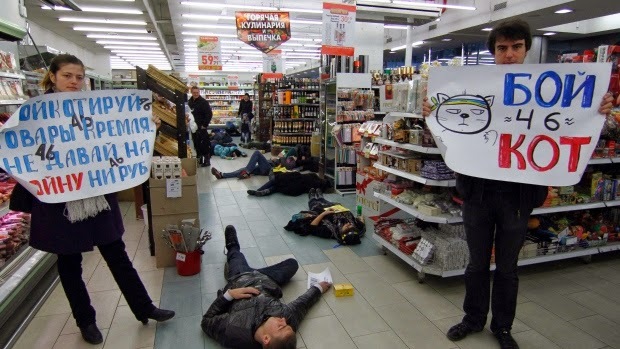 Participants stage a performance demanding that Ukrainians boycott Russian-made goods at a grocery store in Odessa after the annexation of Crimea by Russia. She looked at home behind a counter strewn with the trappings of an Italian restaurant — a wine decanter, bread sticks, an antique scale. On the television were disturbing images of a youth with a bruised face, apparently beaten up. We ask her what it was all about. The smiling, 20-something face suddenly crumples in defeat, like a lamp abruptly turned off. “The news is all bad,” she says, absentmindedly as she stared up at the television. “I don’t know why I came back.” Kiev was home, but she was pining for Washington, where she had studied the hospitality business. She had returned to Ukraine, hopeful that things had changed. They had, but for the worse. The city that started Ukraine’s revolution, and gave dozens of young lives to it, now finds itself at the centre of something far messier: a territorial dispute with a powerful neighbour, an economic mess, and an ongoing international wrangle. After the highs of revolution, the disappointment in Ukraine is deep. And it echoes the disillusionment that has become, in many parts of the world, the hallmark of a tortured generation. The discontent stretches from the angry streets of Venezuela to Beirut to Greece — where disappointed young people are emigrating in the thousands again in search of an economy that will accommodate their ambitions. But it’s worst in a place like Kiev. Or Egypt, where the thunderous promise of change in Tahrir Square made way for chaos, bloodshed, and now, a fierce crackdown that has, according to one estimate, led to the imprisonment of more than 16,000 and the death or injury of 20,000 since it started last July. Ukraine is not Egypt — far from it — but among young people, the sentiment is the same: a profound sense of being let down. That may be a bigger peril facing Ukraine’s future than just about any other. Though it doesn’t often come up in formal interviews, for many the setback has triggered both disappointment and contingency plans: especially for emigration. Ukrainians are highly mobile, and young people who successfully thrived abroad before may now be looking to return. But the tension with Russia that followed the revolution has also galvanized some Ukrainian youth, turning them from revolutionaries into activists, and in some cases, even into soldiers. Much of the focus has been on the country’s beleaguered and under-resourced army. We met young people in Donetsk, in Eastern Ukraine, who volunteered to gather supplies and drive them to spots near the border where soldiers — most of the same age — languish in fields waiting for the Russian threat to materialize. On the day we met them, they had gathered rain jackets, food, clothing and medicine to take to the troops. The very act is rooted in a sense of abandonment. “Sometimes I think our army is lost, and everyone forgets about it, even in government,” said Lena Hlazunova, whose own home is hostile terrain. Her parents oppose the revolution and want Donetsk to rejoin Russia. That need comes in different forms. At the border between mainland Ukraine and Crimea, we met a group of young Ukrainians building a huge stage, preparing for a concert to support their troops. It was the day after Russian President Vladimir Putin signed the law annexing Crimea into the Russian fold. Ahead of them is a Ukrainian military base sandwiched between the highway and the sea, complete with trenches, guns, and soldiers — the intended audience. “Ukrainian people support Ukrainian soldiers, it’s a fight for Ukraine,” said Nikolai Feldman, one of the organizers. The concert was being broadcast on local radio, but only a handful of teenagers turned up. A lone soldier walked up closer and stood across the highway to watch. In Kiev especially, though, the disappointment lurks everywhere you look. Especially in the way the international community has responded to the crisis with Ukraine’s far more powerful neighbor. Many here feel they’ve been left alone to contend with the new reality. We have a stock of them for the next 300 years,” said Ukrainian MP Lesya Orobets, who has been in parliament since 2007. She is all of 31 years old. We speak in the lobby of a hotel on Independence Square that had been used as a makeshift hospital and morgue when the protests were at their height and the old regime deployed snipers. The sense of loss still hangs in the air. It’s one among many regrets here. Ukraine’s — and Greece’s and Egypt’s — challenge is to tip the balance among their young from regret to hope. 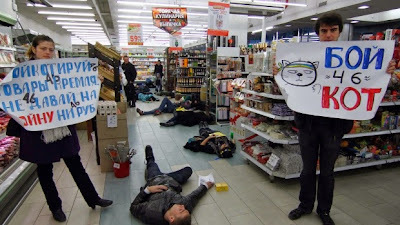 In Ukraine, it means helping them understand that revolution must be judged in the long term. It isn’t easy without some proof of progress in the short term that shows their sacrifices have actually been worth it.